The fact that someone with as high an international profile as Hillary Clinton was in Swansea to receive an honorary doctorate from the university and see the law school renamed in her honour was a big occasion in itself, but for me that sense of occasion was transformed by the fact that whole day centred around the issue of children’s human rights. As Wales’s independent commissioner for children’s rights, whose all-Wales office happens to be located in Swansea, this was for me a most welcome focus. To me, there were two highlights in a day of ceremonies. These were Mrs. Clinton’s speech during the awards ceremony, and the involvement and engagement of children in the day. The speech was delivered with the engaging style of someone who is used to holding the attention of audiences worldwide. Mrs Clinton spoke about her early engagement with children’s rights, by interning with and then working for the Children’s Defence League as a children’s rights lawyer in the early years of her career. She spoke about fighting to remove children from adult prisons and gain access to schooling for disabled children. She went on to lay out the current huge challenges facing children’s rights globally, focusing particularly on child poverty, including the challenge facing us in Wales. She encouraged the audience, which included the First Minister, the Secretary of State for Education and several Assembly Members and MPs, to keep the eradication of child poverty as a high priority. Mrs Clinton did not shy away from acknowledging that the USA is the only nation not to have signed the UN Convention on Children’s Rights, an omission she said was ‘beyond explanation’. Hillary Clinton spoke passionately about children and young people’s involvement in society and government, noting that the current discord in the USA makes it impossible for children’s voices to be heard ‘above the cacophony’. She noted that the Children’s Commissioners in the four UK nations and the Irish Republic have expressed our concerns about the impact of Brexit on children and expressed her own concerns about the uncertainty over the residency rights of half a million children in the UK and the impact this may have. The visitor’s interest in participation of children and young people was exemplified by her warm engagement with children throughout the afternoon. Swansea University’s law school is a leading centre for children’s human rights and lives up to this with a number of projects that involve children directly in developing new understanding of rights. The Little Voices project, part of the Observatory for Children’s Human Rights in Swansea Law School, had arranged for children from three schools, Pentrehafod Comprehensive, Narbeth Primary School and Blaenymaes Primary to display their work on rights and democracy. The children spoke passionately about their commitment to children’s rights and how they are enacted in their school. I was proud of how well so many schools in Wales have embedded children’s rights into every aspect of school life and how it makes a difference to their values and sense of community. 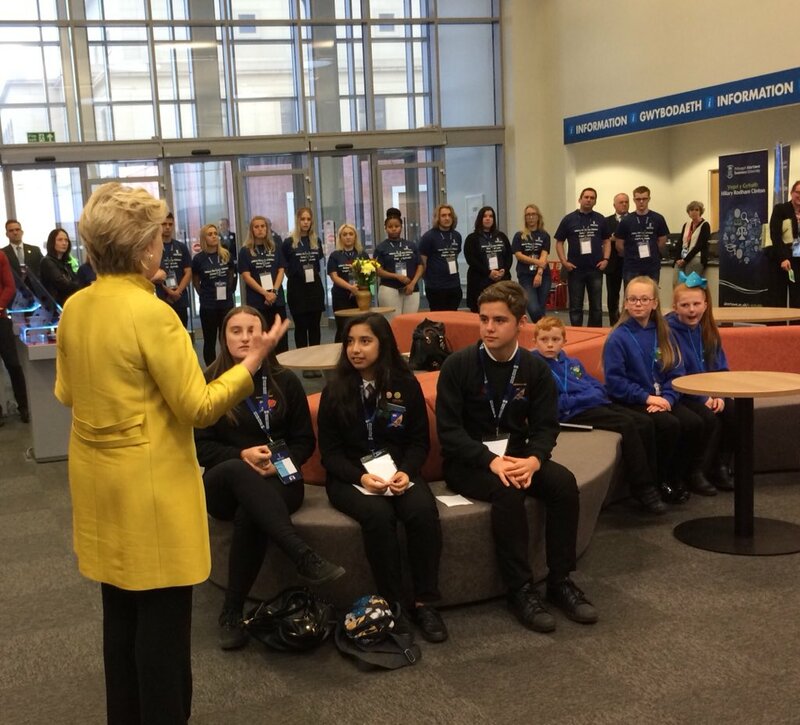 I was honoured to have the chance to have a brief word with Mrs Clinton about my role and a couple of my passions – the forthcoming Youth Parliament and the Government’s welcome recent commitment to give children equal protection in the law from physical punishment. As children’s commissioner for Wales, to have a roomful of Wales’s most influential people, Hillary Clinton, the press and children all together concentrating on children’s rights for a full day was a very welcome and positive experience. I hope it will focus all of our minds on putting children at the heart of our priorities.